Is Summer Scholars administered by the University of Miami ? Yes – Summer Scholars is administered by UM's Division of Continuing and International Education. 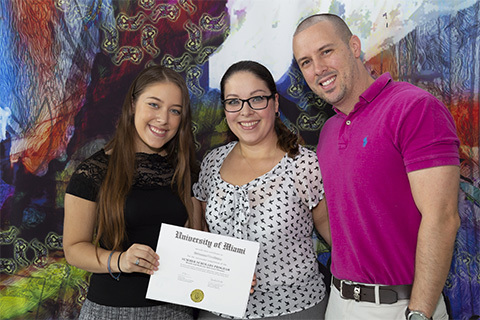 We are UM's precollege program that offers courses for college credit. We have a long history developing and managing a precollege experience for high school students – UM established the Summer Scholars Program in 1991. Our courses are developed and offered by UM's 11 schools and colleges, and taught by UM faculty and instructors. How do I know if a summer program is administered by the University of Miami? Choosing a precollege program can be challenging to navigate, as there are many options available. Most important, it's about finding the right fit, academically and socially, for the student. Most universities and colleges offer precollege programs. However, many summer youth programs are hosted on college campuses, but are not administrated by the university or college where their program is being offered. For instance, programs operated by external organizations might describe themselves as "@ the University of Miami;" these programs typically contract with conference housing to rent on-campus housing, classroom and lab space; while supplying their own instructors. If you are unsure if a summer program is administered by the University of Miami, we recommend that you reach out to the program directly for information on their relationship with the University. What are the dates for the 2019 Summer Scholars Program (SSP)? 3-Week Credit Program: Saturday, July 6 – Friday, July 26. For a detailed schedule visit Program Dates. The application review period is from September through June. Applications are reviewed when all application materials are received. An admission decision is sent within 7-10 business days of receipt of all application materials. Students are encouraged to submit their applications early to reserve space in their preferred program. For deadline dates and information visit Application Deadlines. For more information on the application requirements and steps visit Apply Now. International students are welcome and encouraged to apply. If your native language is not English, applicants are required to submit a TOEFL/IELTS score with their application. Applicants must meet UM's English Proficiency Requirements to be eligible for the Summer Scholars Program. For more information visit International Applicants. Can students commute or must they live on campus? Commuter options are available for the Summer Scholars Three-Week, Credit Program. Commuter options vary by program for the UM Academies Two-Week, Non-Credit Program. To be in a commuter status, students must have a Florida residence located in either Miami-Dade or Broward counties and reside with a family member over the age of 21. Commuter students are not the responsibility of the University of Miami once they leave campus (unless traveling on a program sponsored activity – departing from and returning to campus on program transportation). For information on commuter options, visit Tuition and Fees. Where should I send the application materials? Teacher and Guidance Counselor recommendations are part of the online application. Enter the contact information for your Teacher and Guidance Counselor in the application. Once the recommendation request has been submitted, the recommendors will receive an email with a link to fill out the recommendation form online. Responses will be sent directly to our office. High school transcripts should be mailed to the Summer Scholars Program office to the address below. High school counselors may email transcripts directly to the Summer Scholars office at ssp.docs@miami.edu. Attention Counselors: transcripts must be sent directly to the Summer Scholars Program office; they should NOT be sent to the University of Miami Office of Admission – as this is a separate office. Supplemental documents for international students, including passport ID page, bank letter and TOEFL/IELTS report, should be emailed to ssp.docs@miami.edu. For detailed information on the application process visit Apply Now. When will my file be reviewed for admission to the program? Application files are reviewed once all documents are received by the program office including: essays, transcript, teacher recommendation, guidance counselor recommendation, and TOEFL/IELTS score (international applicants). Allow 7-10 business days for review once the complete application has been received by the SSP office. Admission decisions will be sent by email. Will students be notified of missing application documents? The purpose of our application process is to acquaint students with the college application process that they will experience soon. Though SSP staff sends courtesy emails to inform the student when a document is received, ensuring the application is complete is the responsibility of the student and parent/guardian. Will students need to purchase textbooks for class? No – textbooks and instructional materials are provided to students by the program. What is the class schedule and how are classes structured? The courses are structured around hands-on experience, which may consist of lectures, guest speakers, open discussion, lab work, and field trips. For class schedules visit Campus Life. What school supplies should students bring? Students should bring supplies that they would use during the normal academic year like paper, pens, pencils, backpacks, and folders. Specialty items may be needed, however this information will be communicated to the students prior to their arrival on campus. Should students bring a laptop? Bringing a computer is at the discretion of the student; many students choose to take class notes on a laptop and read class materials on their laptop/tablet. All SSP students have access to the University of Miami Richter Library, which is open until 9 p.m.; however many students prefer to complete course assignments in their rooms. Do students earn academic credit? Students enrolled in the Summer Scholars Three Week Credit Program earn college credit and their grades will be part of their official record at the University of Miami. What does the student's official record consist of at the University of Miami? Students enrolled in the Summer Scholars Credit Program will have an official student record at UM, which includes classes taken, grades earned, and grade point average (semester average and cumulative average). This information is part of the student's permanent record at the University of Miami. Grades earned during the program will be included in the calculation of the student's overall academic record should they gain entrance to the University as an undergraduate student. Can I transfer my University of Miami credits to other universities or colleges? Students can petition to transfer their UM credits to other universities and colleges. Students must request an official transcript (fee applies) from the Office of the University Registrar to be mailed to the institution that will apply the credit. Transcripts can also be ordered through CaneLink. It is the student's responsibility to keep course syllabi and graded work, as the receiving institution will often request these materials. It is the sole discretion of the receiving institution to accept and apply credits. Can college credit be used as high school credit? The University of Miami issues undergraduate college credit for the Summer Scholars Three-Week, Credit Program. For information about high school credit, students should contact their high school guidance counselor as the policy varies from high school to high school. Will attending the program help students if they apply to the University of Miami? The University of Miami welcomes Summer Scholars to apply as undergraduates; however, attending the program does not guarantee admission nor is special consideration given to Summer Scholars Program alumni. For information on the undergraduate application process visit the Office of Undergraduate Admission. For more information visit Summer Scholars Tuition and Fees. Application Fee: The non-refundable $75 application fee is additional to the Tuition and Program Fee. Fees not included in the Tuition and Program Fee are: transportation to and from campus, meals off campus, shopping, spending money and medical expenses. Parking Permit: Commuter students may purchase a parking permit if they wish to park on campus. Marine Science Credit Students: Students enrolled in a marine science credit program will be required to submit a $325 Marine Science Exploration fee in addition to the Tuition and Program Fee. Weekend Workshops: Students who are not enrolled in a marine science program can also experience South Florida's unique marine activities including shark tagging with UM's Shark Research and Conservation Program for $225 and/or a dolphin encounter in Key Largo for $175. Space is limited and available on a first come, first served basis. Limited scholarship funding is available to eligible applicants applying to the Summer Scholars Three-Week, Credit Program. Scholarship applications are due by March 1. Click here for scholarship information. Please note, financial aid is not available for the Summer Scholars Program. I am a University of Miami employee, can I use my tuition benefits? University employee dependents are welcome to apply to the program. Tuition remission is available to eligible employees for the Summer Scholars Three-Week, Credit Program. Students may attend as either a resident or commuter. The benefit is applied to the tuition portion ($5,990) of the Tuition and Program Fee. Please note program fees are not covered by Tuition Remission. Contact HR – Benefits Administration to inquire about eligibility. To qualify, dependents must be registered with HR – Benefits Administration. How do I access CaneLink? Click here to access CaneLink. For assistance with CaneLink visit Student Center Help. Who can assist me if I cannot remember my Cane ID or my password? For issues with a CaneID or password, the student should contact the University of Miami IT Department at (305) 284-6565, select option 1. Can students select their roommates? Students will complete a Roommate Questionnaire before arrival to campus, and will be matched based on gender, program and compatibility. Will commuters enjoy the program in the same manner as residential students? The Summer Scholars Program is designed for the enjoyment of all participants. Commuters in the Summer Scholars Three-Week, Credit Program are encouraged to participate in evening and weekend activities to gain a fuller sense of campus life. Program activities provide students with the opportunity to bond outside of the classroom and develop mature interpersonal relationships with a diverse group of students. Students use their free time to work on class assignments, study at the library, swim at the campus pool, exercise at the Wellness center, explore campus, and join evening and weekend activities. Are campus activities available for students? Yes! The program provides a variety of evening and weekend activities on campus. Off-campus weekend activities include: snorkeling in Key Largo, exploring the Everglades, attending a Marlins game, touring Miami Beach, going on shopping outings, and earning community service hours. All activities are chaperoned by program staff. Students can enroll in weekend workshops for an additional fee: a dolphin encounter in Key Largo and/or shark tagging with UM's Shark Research and Conservation Program. Space is limited; workshops are reserved on a first come, first served basis. Are televisions available for students to watch? There are no televisions in the residence halls, however students may bring their own. CableTV service is available in the residential rooms. While there is a great deal of independence given to participants, the safety of our Summer Scholars is our primary concern. Residential staff, managed by Summer Discovery, reside in the residence hall and chaperone on- and off-campus activities. Students are not permitted to leave campus unless accompanied by program staff. Parents and guardians should note that students will need a high level of maturity and self-responsibility for this program. What steps are provided to ensure safety on campus? The University of Miami Police Department (UMPD) is dedicated to providing a safe and secure environment for all members of the University community who study, research, work, and live on the Coral Gables Campus. Public Safety services are available should students need assistance at any time. Security at UM operates 24 hours-a-day, 7 days-a-week. For more information visit Campus Safety & FAQS. The Department of Housing and Residential Life prioritize student safety and security. Housing and Residential Life Security staff consists of security supervisors and security assistants, who provide overnight services to residents between the hours of 10 p.m. and 8 a.m. Living areas in the residence halls are only accessible by University issued ID cards. Non-program participants are not permitted beyond the lobby of the residence hall except for move-in and move-out day. Residential students are not permitted to bring cars to campus nor are they allowed to be in the vehicles of commuter students. All campus sponsored field trips are chaperoned by program staff. Yes, residential students must be on the Summer Scholars floors by 10 p.m., on their own floor by 11:00 p.m. and in their rooms by midnight. Commuter students must depart campus by 10 p.m.
Do most parents accompany students to campus on the first day of the program? Families who live within a four to five hour drive of UM usually bring their son or daughter to campus; residential students are not permitted to bring a vehicle to campus. Out-of-state and international students typically fly unaccompanied to Miami. Is airport pick-up available for students flying to Miami? Airport pick-up is available for students arriving to and departing from Miami International Airport (MIA). Students will be greeted by program staff members. Students arriving via Ft. Lauderdale Airport (FLL) or by other modes of transportation (bus or train) will need to provide their own transportation to and from campus. Is transportation to campus provided for commuter students? Commuter students must provide their own transportation to and from campus. Commuter students may drive to campus, however they are required to purchase a parking permit. For off-campus program activities, commuter students must use SSP sponsored transportation which departs from and returns to the Coral Gables campus. Can I visit campus before the start of the program? You are welcome to visit campus. Click here to schedule a campus tour through the Office of Admissions. To meet with the Summer Scholars Program staff, please email us at ssp@miami.edu. How can students access their grades after the program? Students can access their grades and unofficial transcript in CaneLink. For students attending in Summer 2019, grades will be available on August 14. I am no longer able to view my grades in Blackboard. Blackboard is an online tool used by students during their course to access course documents and track grades. At the conclusion of the Summer Scholars Program, students will access their grades and unofficial transcript in CaneLink. How can I order a transcript to send to another university? Official transcripts (fee applies) must be ordered through the Office of the University Registrar. Students can order transcripts online from the Office of the University Registrar by clicking on "Alumni and Former Students," or via the student's CaneLink account. It is recommended to request official transcripts one month prior to the application deadline of the college/university to which they are applying. For assistance ordering transcripts in CaneLink visit Student Center Help. Who can I contact if I have questions about applying to UM as an undergraduate? Will attending the Summer Scholars Program help students if they apply to the University of Miami?